We will hold orders until you are finished buying. I-DEAL Components. 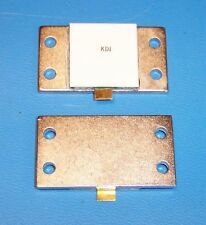 MIDISCO Model MDC1012-20 Fixed Coaxial Attenuator, New, 1 Piece. SMA (male) - SMA (female). Low VSWR: DC-1GHz 1.2, 1 GHz to 2.5 GHz 1.3. DC to 2.5 GHz. 20 dB Attenuation. 50 ohm characteristic impedance. 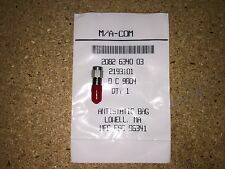 M/A-COM 2082-6340-03 SMA Fixed Coaxial Attenuator Ultra Miniature. UNICOM POE-63208T SMARTPoE 8 Port 10/100 Managed PoE Switch with 2 Gigabit Combo. The New Century Group. We will together find the best solution to your problem. Included exactly what is pictured. 6dB attenuation. "F" male to female. 10dB attenuation. "F" male to "F" female. Product Title: FiberTool FC/APC 5dB Female to Male SM Fiber Attenuator. FC/APC 5dB Female to Male build out singlemode fiber attenuator. An attenuator is used in fiber networks to reduce the optical signal between two points. Attenuation: 15dB. 1 x Attenuator. Connector: SMA. Material:Copper with gold plated. Frequency Range:0-6.0GHz. Checked for accurate resistance. I've used several of these in projects and they're excellent. (Make NOISE!). Attenuation: 30dB. 1 x Attenuator. Connector: SMA. Material:Copper with gold plated. Frequency Range:0-6.0GHz. 100pcs x quick splice wire connectors (other accessories are not included). Quantity: 100pcs. Type: 2Pin connector. Widely used in the cable connection. Use with male quick disconnect for easy secure connection in cables. Attenuation: 20dB. 1 x Attenuator. Connector: SMA. Material:Copper with gold plated. Frequency Range:0-6.0GHz. 1 x Attenuator. Attenuation: 3dB. Connector: SMA. Material:Copper with gold plated. Frequency Range:0-6.0GHz. Attenuation: 10dB. 1 x Attenuator. Connector: SMA. Material:Copper with gold plated. Frequency Range:0-6.0GHz. Attenuation: 6dB. 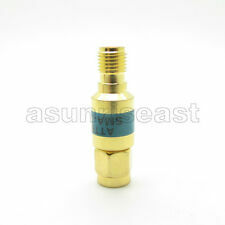 1 x Attenuator. Connector: SMA. Material:Copper with gold plated. Frequency Range:0-6.0GHz. Attenuation: 6dB. Power: 10W. Frequency:DC to 3.0GHz(0-3.0GHz). Connector: N type. 1 xAttenuator. 100pcs x quick splice wire connectors (other accessories are not included). Quantity: 50pcs. Type: 2Pin connector. Widely used in the cable connection. Use with male quick disconnect for easy secure connection in cables. Specification: Description: Features: AC 250V Rating Voltage, 10A Current, 3Pin Socket. Specialized in the production of various AC power cord connector, electronics, machinery, other Industries. Attenuation: 20dB. 1 x Attenuator. Power: 30W. Frequency:DC to 3.0GHz(0-3.0GHz). Connector: N type. Working Temperature:-55℃ - 125℃. 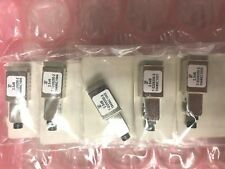 Description: 20 Pcs RS232 9 Pin Serial Male and Female DB Connector Soldering. RS232 Serial DB9 9 Pin D-sub Male Connector for LCD, computer. Package Include: 10 x Male Connector, 10 x Female Connector. TNC (male) - TNC (female). Midwest Microwave Model 224-6 Fixed Attenuator, 1 Piece. DC to 12.4 GHz. VSWR, DC to 12.4 GHz, 1.25:1. 6 dB Attenuation. C to 125 deg. 50 ohm characteristic impedance. Sorry, no local pick-up for this item. Attenuation: 30dB. 1 x Attenuator. Power: 30W. Frequency:DC to 3.0GHz(0-3.0GHz). Connector: N type. Working Temperature:-55℃ - 125℃. Specification: Description: 10m 33Ft 30AWG 0.65mm Hi-Temp High Tempreture PTFE Wrap Cable Wire Cord Green. Specification: Description: 5m 16Ft 30AWG Hi-Temp High Tempreture PVDF Wrap Cable Wire Cord Green. Specification: Description: Great for Replacement. Specification: Description: Great for Car PC PSU Supply PCB Mainboard Connector. Specification: Description: 10m 33Ft 30AWG 0.65mm Hi-Temp High Tempreture PTFE Wrap Cable Wire Cord Yellow. 1 x Socket. 1 Set of Socket fixing screws. Plug size: PLS 20. Quantity: 1 set PLS 20, 8-Pin or 9-pin or 12-pin. Mounting plate: 29mm square. 1 x Waterproof Cover. Deal with the problem Country Approx. NEMA L14-20, 20A 125/250V, 3Pole 4Wire Grounding TypeGreat Suitable for Generators, Transfer Switches, Welding Equipment, RV Camper Power InletHigh quality nylon body resists damage from severe impact, abrasion and chemicals Solid brass blades are fitted and held securely in place UL Listed Approved ReceptacleNEMA configuration, agency certifications and device rating are molded on front of device to assist with identificationPackage Content:1 x Locking Receptacle for Generator. NEMA L14-30, 30A 125/250V, 3Pole 4Wire Grounding TypeGreat Suitable for Generators, Transfer Switches, Welding Equipment, RV Camper Power InletHigh quality nylon body resists damage from severe impact, abrasion and chemicals Solid brass blades are fitted and held securely in place UL Listed Approved ReceptacleNEMA configuration, agency certifications and device rating are molded on front of device to assist with identificationPackage Content:1 x Locking Receptacle for Generator. NEMA L5-30, 30A 125V, 2Pole 3Wire Grounding TypeGreat Suitable for Generators, Transfer Switches, Welding Equipment, RV Camper Power InletHigh quality nylon body resists damage from severe impact, abrasion and chemicals Solid brass blades are fitted and held securely in place UL Listed Approved ReceptacleNEMA configuration, agency certifications and device rating are molded on front of device to assist with identificationPackage Content:1 x Locking Receptacle for Generator. NEMA L15-20, 20A 250V, 3Pole 4Wire Grounding TypeGreat Suitable for Generators, Transfer Switches, Welding Equipment, RV Camper Power InletHigh quality nylon body resists damage from severe impact, abrasion and chemicals Solid brass blades are fitted and held securely in place UL Listed Approved ReceptacleNEMA configuration, agency certifications and device rating are molded on front of device to assist with identificationPackage Content:1 x Locking Receptacle for Generator. 100pcs x quick splice wire connectors (other accessories are not included). Type: 2Pin connector. Widely used in the cable connection. Use with male quick disconnect for easy secure connection in cables. Attenuation Values: 10dB. Peak Power: 1000 Watts. Input Power (average): 20 Watts @ 25° C. Attenuation Accuracy:DC-1000 MHz ± 0.25 dB, 1000-4000 MHz ± 0.5 dB. Frequency Range: DC-4000 MHz. Specification: Description: Electrical wire cable 227 IEC 53(RVV). General purpose PVC insulated low voltage cable. .
Male/Female Thread Length 15mm/0.6". Color Silver Tone. Net Weight 182g.